Vivian Jacobson. Photo by Don McKenzie. Nearly 30 years ago, when my husband, Ralph, was retiring from his career as a senior attorney for Sears, Roebuck and Company, we started to discuss plans for the next stage of our lives. We both wanted to leave Chicago, where I grew up and where we raised our two sons. I wanted to live on a kibbutz in Israel; I had spent five summers in my early 40s teaching swimming and training swim instructors at different kibbutzim. His choice was to retire to the mountains in western North Carolina. A friend recommended Pinehurst, N.C. I was hesitant as the Jewish community in the area was practically nonexistent and Jewish education and connections had been an integral part of my life since my childhood. I am an alumna of Camp Ramah in Wisconsin and spent many summers as a swimming instructor at Jewish camps in Wisconsin and Michigan. Ralph’s response? “You can do more for the Jewish people in Pinehurst than you can do in Israel.” He turned out to be right. We settled in Pinehurst in 1990 and became part of the Sandhills Jewish Cultural Group, which was then comprised of 20 senior citizens and one young family with a child. In the ensuing years, the congregation—now an official Reform temple, Sandhills Jewish Congregation-Beth Shalom, relocated to neighboring Jackson Springs—grew to a membership of nearly 170 individuals from around the region, with 22 children currently attending a Hebrew school I helped create with another member. My Jewish life in Chicago had been simple compared to the challenge of building a new Jewish community in the South. Using the model of the Jewish Agency for Israel’s aliyah movement, we recruited families to move to Pinehurst from all over the United States, including California, New York, Ohio and Tennessee. As part of the membership committee, I helped people find homes and schools for their children and introduced them to our wonderful cultural events and advanced medical environment. My longstanding passion for Marc Chagall and his art also continued to sustain and inspire me. Before our move to Pinehurst, my interest in art was enhanced by frequent visits to the Art Institute of Chicago, where I spent many hours absorbed in the museum’s Chagall collection. In September 1974, Ralph and I had the honor of hosting a reception at our home for the celebrated artist on behalf of the Hadassah Medical Organization of Jerusalem, where some of his most famous stained-glass windows had been installed more than a decade earlier. Vivian Jacobson with one of her swimming students, Gisela Danielson. A warm friendship grew, and I worked closely with Chagall in the last 11 years of his life on major international projects, including raising money and visibility for the Musée Marc Chagall in Nice, France. I became a lecturer on the artist’s life and work, a role that continued to develop after we moved to North Carolina. He was more than a powerful force as a painter, writer and poet. Chagall was a perceptive person with an intelligent, inquisitive mind and a delightful sense of humor. He sought to instill through his work the elements of hope, peace, reconciliation and love. Chagall’s artistic accomplishments in the last 30 years of his life—he died in 1985 at age 97—sent a clear message: You can get older, but you do not have to get old. 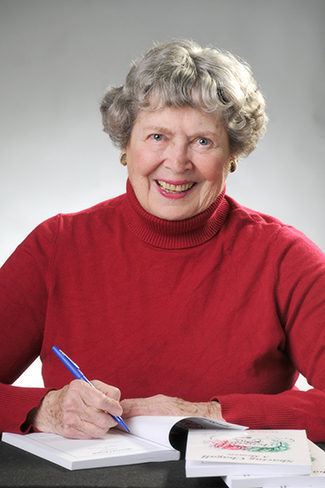 Now at age 82, I find myself in a balancing act, navigating between my late-blooming career, my loving marriage, my children and grandchildren, and my community. I am in good health thanks to my lifetime of swimming, which today includes distances of 1,000 yards several times a week. I have the strength and energy to continue living a full life. 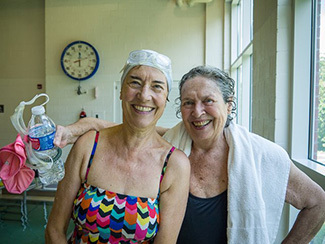 I also continue to teach swimming to senior citizens—some of whom suffer from arthritis, bronchitis, cardiovascular and orthopedic problems—helping them to improve the quality of their lives through exercise. gone and we fly away. It was evident that Ralph’s words had borne fruit; I have been able to continue and expand my lifelong commitment to the Jewish people in a town known more for its famous golf resort than its Jewish life. Ralph and I recently celebrated our 61st wedding anniversary, and we have grown much closer as time goes by. May all this happiness and good health continue for years to come. Vivian R. Jacobson, a life member of Hadassah, is the author of the self-published Sharing Chagall: A Memoir. She and her husband established a chair in internal medicine at Hadassah Hospital in memory of their parents (vivianjacobson.com).